The Sennheiser HD 429 melds cutting edge sound with ultra-modern design. The closed-back design blocks ambient noise for use on-the-go, or in front of the latest movie download. The outer cup is covered in a textured grid which adds stability while showcasing the logo synonymous with true sound. The single-sided cable stays tangle-free, making it easy to use and store- if you can find a reason to take them off. Enjoy powerful, clear bass response with batteries or separate amplifier circuits with the HD 429 around-the-ear headphone. 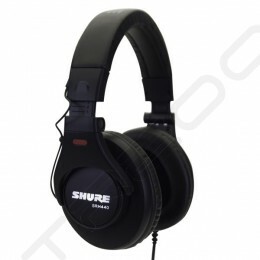 The closed-back design and soft ear pads block outside noise, ensuring only the music reaches your ears. The ergonomic design is ideal for long-term comfort, making the HD 429 a perfect companion for your music. Includes a ¼” (6.3 mm) adapter plug for your home A/V system.